Historic, yet modern. Vibrant and growing. Welcome to Newport. Newport, Kentucky is a beautiful blend of old and new. Founded in 1795, its tree-lined streets take you past lovingly restored historic homes, with quaint businesses tucked in the neighborhoods. The riverfront is hopping with the new, modern Aloft Hotel and Aqua apartments, which are right next to the Newport on the Levee entertainment complex, the Newport Aquarium and the Purple People Bridge. Newport’s restored historic homes are hot commodities, as new residents move in to take advantage of this friendly, walkable community. 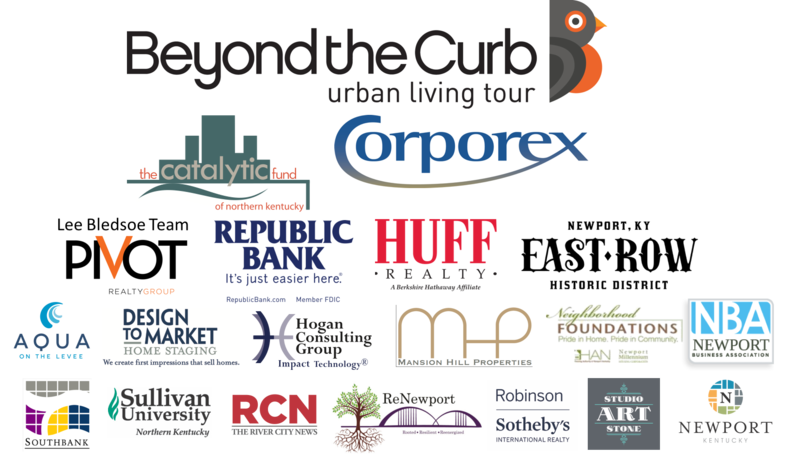 BEYOND THE CURB | NEWPORT was on tour October 1, 2017. Come to the registration center at Wooden Cask Brewing Company, 629 York St., Newport anytime between 10:00 AM and 3:00PM to pick-up your tickets and other event day materials! At the registration area you will receive an official event ticket that is your exclusive admission into each of the properties. You will also receive an information packet with a map, additional details about each of the properties and about Newport’s amenities!